I think I've mentioned before my weakness for sweets involving the whipping of egg whites and sugar. This includes: meringues, macarons, and nougats. Three of my biggest loves. Meringues were the first thing I attempted to make when I got an electric hand mixer. After that, macarons became my obsession. Recently, the gastronomic world has also become macaron-obsessed. Nougats...not so much. 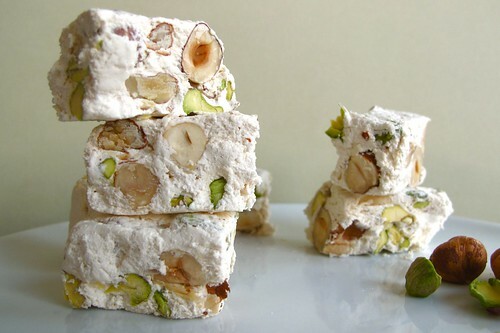 Therefore, when I stumbled across a nougat recipe a few week ago, I became determined to give it a try. Halfway through the process I wasn't sure if I would end up with actually nougats. I was staring at a messy, sticky, sickly honey-scented glob in a bowl. In the end, with patience and constant stirring over a double broiler, I was rewarded with pillowy, chewy, pieces of nutty satisfaction. YUM. However, word of caution: only attempt to make these if you truly love nougats. It is well worth the process but the sticky mess was a bit of a hassle to clean up! 1. Line a 9 x 13 brownie pan with plastic wrap. Let the plastic wrap overflow on each side. 2. In a saucepan, heat honey, sugar, and water until it reaches 289 degrees F or 143 degrees C on a candy thermometer. 3. Meanwhile, beat egg whites with salt until frothy. Gradually add a tablespoon of sugar taken from the original quantity to help the egg whites become stiff. 4. With the mixer on medium, slowly pour in the syrup once it has reached the correct temperature. 5. Add vanilla extract and continue beating on high for about a minute. 6. Transfer the mixture into a double broiler and "dry" the mixture on low heat while stirring with a wooden spoon. Once the mixture comes off the bottom of the bowl, it is "dry" enough and the ideal temperature has been reached. Remove from heat. 7. Stir in pistachios and hazelnuts. 8. Transfer the mixture into the plastic wrap lined pan and spread into an even layer. Fold the extra plastic wrap over the top of the mixture. 9. Use a heavy textbook to weigh down the nougat as it cools to room temperature. 10. Cut into pieces with an oiled knife. The nougat will keep for 3 months. Voila! 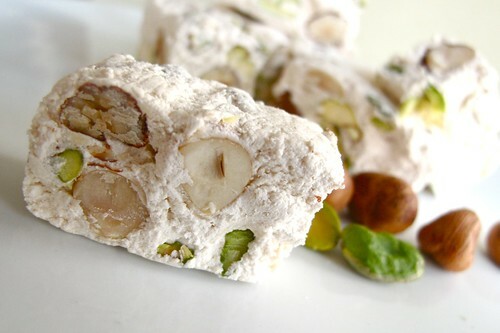 Delicious fresh homemade nougat! I love nougat. I lost two crowns eating them a few years back. They are one of my Christmas favorites. Yours look delicious! I love nougat, ever since my trip to Spain long ago. So is the texture of these soft and chewy or more hard and dense? The texture is definitely more soft and chewy--not hard or dense at all. Nice photos. Looks really delicious. Gorgeous pictures & a great sounding candy. Delish!! I just made these and I'm not sure if I didn't heat them over the double broiler for long enough but the final product is extremely soft and mushy. Do you know where I may have missed something? It tastes FABULOUS though! about how long did the drying method over the double broiler take for you?